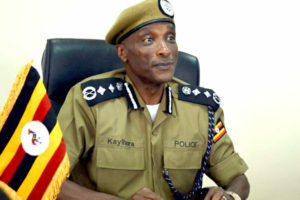 The Inspector General of Police, Gen Kale Kayihura, has said he is on a mission to clean up the Force from infiltration by ‘dirty’ officers at what he calls the bottom. Addressing residents in Mubende District on Friday Gen Kayihura assured them that his move at cleaning the Force was going to ensure he brings them ‘angels’. The residents had reported to the embattled IGP, officers who they claim were siding with land grabbers. “As a commander on top I am still very clean. I am on the operation to build police afresh starting with Mubende. I have suspended these officers and I promise I am bringing you angels who will work,” Gen Kayihura told a cheering crowd. Gen Kayihura suspended four officers; SSP Christopher Barugahare, the Wamala Regional Police Commander, Mubende District Police Commander, ASP Charles Magoola, the OC –CID Mubende, SP Dawda Swalik and Mubende Police OC Lands, ASP Hakim Mukama. “I cannot keep answering for people who cannot work. We are going to bring genuine police officers. Have hope and forgive us for whatever has gone wrong,” Gen Kayihura said. The IGP’s comments come at the peak of controversy that has mirred the police Force, also dragging his name into the matters. Last month, the Chieftancy of Military Intelligence arrested several members of the group Boda Boda 2010, including its maverick leader Abdul Kitatta. The group has been accused of a number of crimes committed in Kampala and the arrested members are facing charges of murder, extortion and theft among others. At the peak of the arrests, then Buyende DPC, Muhammad Kirumira, was summoned to answer to charges related with crimes he had allegedly committed while commanding Old Kampala Police and Nasaana Police. Kirumira took to the media to resign from the police citing witch-hunt. Mr Kirumira also pointed the finger at his seniors who he said have dragged the name of the Force in mud by participating or siding with criminals. Mr Kirumira was arrested on Thursday and taken to the dreaded Nalufenya, in Jinja District.